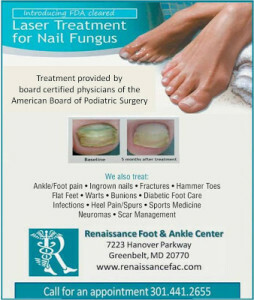 Nail fungus can be treated. Learn how! The nail infection is usually very persistent and the treatment is not simple. Toenail Fungus Infected may cause embarrassment and shame because of the ugly shape of the nails. Toenail Fungus signs include thickened nail plate or nail bed, yellow discoloration of the nails, foot pain and bad feet odor caused by the fungal debri under the nail. The nails often become thick and fragile and can detach from the nail bed or the skin under the nail. Nail fungus usually starts at the distal end of the fingernail or toenail. The infection then spreads to the proximal end of the nail toward the nail bed. The fungal infection then spreads to other toenails, but rarely infects all of the them. Candida and Dermatophytes is the most common fungi causing nail infections. The combination of fungi and moist environment can speed up the fungus growth. Nail fungus infection causes your nails to look ugly thick and yellow, but can also cause other more serious complications. Toenail fungus can cause foot pain, and this pain will only get worse when the infection spreads from one infected nail to the other. Another embarrassing symptom of toenail fungus is bad foot odor. Toenail fungus can result in unbearable foot odor resulting from fungi degree under the nail. The biggest danger is hurting the people you love. Fungus sheds from the nail and spreads all over your house. This fungus shedding can cause toenail infections to other members of your household. For these reasons we recommend to start toenail fungus treatment as soon as possible. Our podiatrists diagnose and cure thousands of nail fungus patients every year. Contact us to learn about our toenail fungus treatment and how our doctors can help you get healthy, clear, fungus-free nails.